The US Water Disruptor Filter is manufactured with Nano Alumina Fibers that have a Zeta potential of 51 millivolts. Many contaminants are actually "magnetically" removed from the water supply and "secured" in the Charged Filter. This is truly "disruptive technology." The US Water Disruptor media is manufactured from a naturally occurring element called boehmite, which has no known Health Side Effects. In fact, boehmite has long been used as an additive to food products and digestive analgesics. Additionally, it has passed testing for NSF/ANSI Standard 42 and 61 for potable water and USP Class VI testing and endotoxin testing. US Water Disruptor Filtration is the final barrier against the problem contaminants such as fine colloids, silica, tannin, and other organics. This systems performance is dependent upon incoming water quality and factors such as iron, sulfur, manganese, sediment and other particulates need to be addressed ahead of the US Water Disruptor Filter. Life expectancy of the filter varies with the water supply, but many users experience filter change intervals in excess of a year when coupled with proper pre-treatment. It is an excellent idea to have a 1 Micron Filter ahead of the US Water Disruptor filter. The Disruptor electro-adsorptive filter media takes out a very wide spectrum of contaminants, including bacteria, virus, cysts and Chromium 6. However, iron, sulfur and manganese must be removed ahead of it. This system’s performance is dependent upon incoming water quality and factors such as iron, sulfur, manganese, sediment and other particulates need to be addressed ahead of the US Water Disruptor Filter. Life expectancy of the filter varies with the water supply, but many users experience filter change intervals of between six months to one-year when coupled with proper pre-treatment. It is an excellent idea to have a 1 Micron Filter ahead of the US Water Disruptor filter. In a sense, it is like ultraviolet or UV disinfection in that the water needs to be free of sediment, silt, algae, sand, iron, sulfur and manganese. There are hundreds of organics in a water supply that can impact its performance, so there are no guarantees on life expectancy, although in most cases, they do last 6 months to a year. Tannins are somewhat problematic. They are removed in over 75% of the cases, but occasionally, they are impossible to remove, due to the nature of the tannin itself or due to other competing contaminants. 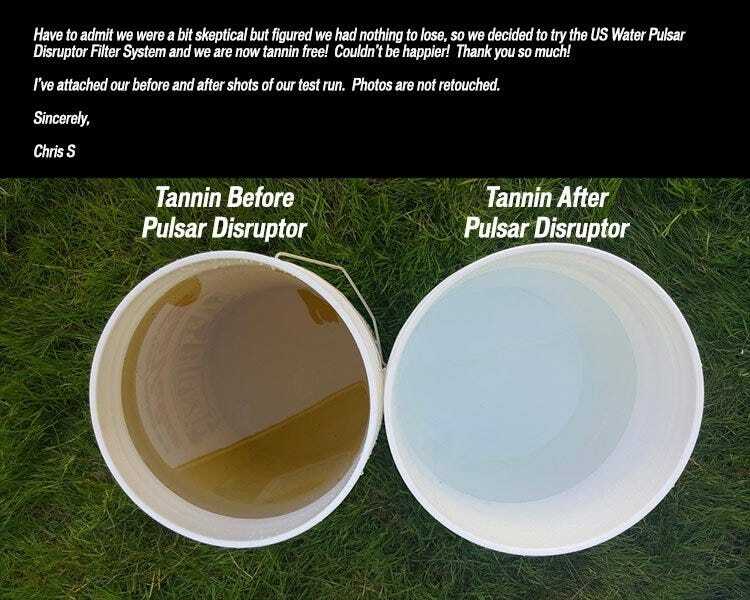 If the tannin is not removed by the Disrupter, then the only choice is a Matrixx Tannin Water Filter that uses sodium chloride as a regenerant. The filter has a one-year warranty for structural integrity and manufacturing defects, but is not warranted against plugging and/or failing to remove tannin. You will still use the housing as a pre-filter if you do not use the Disrupter. Many times, Doctors prescribe medication that works for most people, but not everyone. When he changes the prescription and prescribes another, he doesn’t refund the cost of your former prescription. The Disruptor is an amazing, disruptive technology that removes more contaminants than any other filter. In some cases, we replace the Disruptor cartridge with the Magna Cartridge if the Disruptor plugs too quickly. The Magna Cartridge is available in 20, 5, 1 and .5 micron sizes. If you are unsure how to apply the Disruptor, please contact one of our Certified Water Specialists at 800-608-8792 before purchasing it.